I mentioned last week that if a book is marked up, that means it held my attention. Which is diffic…. Some people may not have the same love of history, theology, WWII, Hitler, assassination plots and knowing about people’s personal lives like I do…but if you are intrigued by ANY of the above or simply appreciate incredible writing, then you will be engrossed with this book. You love Hitler and WWII, Joy? No. I am not a lover of war and when I watch footage of Hitler, my skin crawls. I have been to more than one Holocaust museum and I have been to a number of memorials. “Never again” is the theme. And yet, I find we know very little about the history of what led up to so much of the atrocity. In terms of historical documentation…this just happened. There are still people alive who were victims for crying out loud! However, this book does have some implications on how I want to live my life and who I want to live my life with. 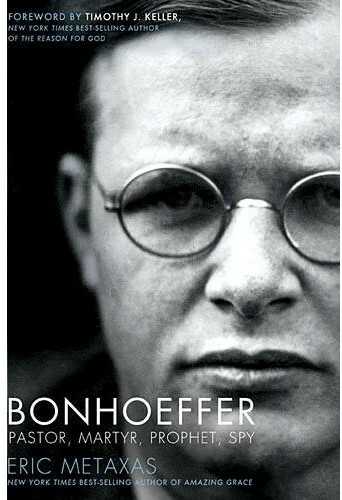 Reading about Bonhoeffer’s love for his fiancé Maria Von Wedemeyer and the interactions between them while he was imprisoned was moving and entertaining. She was quirky, bold and her love for him grew after never even entertaining the idea of a life with “her pastor.” He was significantly older than she was, however once the idea was entertained, her heart opened and her love for him exploded. This biography is also unique because it tells about a woman in Bonhoeffer’s life who is rarely mentioned. She is actually the reason we have most of his early sermons today. They were both theological students and would send their writings back and forth to one another. Bonhoeffer and his love for this seldom mentioned women were a fascinating aspect of the biography. But what was most intriguing to me was his intense academic knowledge and credibility mixed with his love of scripture and people. He had his Ph.D at age 21, yet he was humble enough to believe in the value of teaching children in Sunday school and living life in community. …Rare for someone of his academic and social status. I believe the way he actively engaged with life was the reason he was so prophetic about Hitler’s power. He knew long before others did that Hitler was not who he claimed to be. So much of what we hear about Hitler was at the end of his reign. We don’t study the things he said that sounded so enticing and appealing to a nation that was devastated after WWI. Who could have predicted that this “leader” would be a flat out liar? The radio speech was cut off before Bonhoeffer could finish. Also a foretaste of Hitler’s control to come. But Bonhoeffer kept on with his work. He was a man on a mission. A mission to live a life centered on figuring out how to embody the Sermon on the Mount. (The Biblical passage where he truly believes he understood what it meant to be a Christian.) He approached scripture as if it was God’s word to mankind. He loved mankind in obedience to God’s word. And he lived for God, which resulted in his death. That’s the kind of man I want to partner with in this life. But in all seriousness, I know he was just a man. The book expressed his weaknesses as well as his strength. We must not glorify any human being…but the exciting thing for me was the evolution of his faith and his obedience to the justice and goodness of God’s word. He believed it and therefore did everything he could to live it out, never out of legalism but out of earnest belief that God was a good God. In light of all that was going on in the world, that’s a pretty attractive mind and faith. Read the book. I can say with full confidence that it will transform your mind and faith just as it did mine.